The new Peugeot 308 Hatchback is a stylish and comfortable hatchback that represents a bit of a left-field choice in the family car sector. The likes of the VW Golf and the Ford Focus sell well in this market, which means the 308 has got to be a bit special if it’s to be a viable alternative. One of its standout features is its handsome good looks. Chrome details and LED daytime running lights give it a bit of an edge, while the cabin is equally impressive to look at. The car is also practical and could be an interesting choice if you don’t want to go of the same old same old, but still want quality. 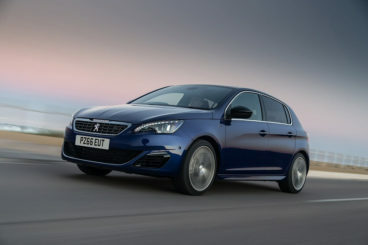 OSV takes a closer look at what it’s all about with our Peugeot 308 Hatchback review. The new 308 offers a decent amount of entertainment on the road, but it’s clear from the minute you get out on the road that this is a car built for comfort more than kicks. The suspension is soft enough to allow for a good amount of body lean when you tackle bends and the steering feels a bit jittery on the motorway. The transmission lacks the precision of VW Golf’s, but the GT model can offer some rewardingly sporty handling, thanks primarily to the lower suspension. The entry-level 1.2-litre petrol engine is hard to recommend because it takes 13.3 seconds to get from rest to 62mph. It is at least smooth, however and very willing. However, it comes with a clunky six-speed manual gearbox that affects all the engines it’s paired up with. For smoother gear changes, we recommend that you snap up the £1,000 6-speed automatic gearbox. If you’re planning on using this car for longer journeys, it’s easy to recommend the 1.2-litre e-THP petrol engine that comes in two separate power guises. The 110bhp variant can do the 0-62mph dash in 11.0 seconds, while the 130bhp does it in just 10.3 seconds. There are more petrol engines in the range, including the GT model that is powered by a vivacious 1.6-litre THP. Capable of delivering up to 202bhp, it can rocket you from a standstill to 62mph in just 7.5 seconds. There are a bunch of diesels to choose from too, starting off with a 1.6-litre 120bhp diesel that covers the 0-62mph sprint in 9.7 seconds while offering good performance and efficiency. The 2.0-litre Blue HDi diesel is quicker and also economical and comes with plenty of mid-range surge that makes it easy and safe to overtake on A-roads. A 308 GT diesel rounds off your selection and can gun you from rest to 62mph in 8.4 seconds. The cabin is a massive improvement on last time around. The interior is now smart and is topped off with a big central touchscreen, although the basic model misses out on this. 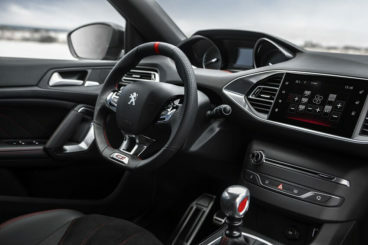 The touchscreen has allowed Peugeot to eliminate most of the conventional dash buttons that cluttered up the place previously, but we get the feeling that the brand still need to tweak it before it becomes seamless to operate. At the moment, it feels a bit clunky. The cabin is mostly pleasing to look at, but it won’t take you too long to spot a few cheap plastics that do blight the overall ambience slightly. The seats offer plenty of comfort though and the driver’s seat and steering wheel, are both fully adjustable so that visibility is good. The car scores well on the practicality front and this is helped by the fact that you can only get it with five doors. As such, access to the rear is a cinch, thanks to rear doors that open wide. However, rear seat space is compromised by the cavernous boot and you get the impression that Peugeot are guilty of putting all their eggs in one basket here. In fact, the boot is so big that you could fit all the eggs in it. It measures 470-litres which makes it some 90-litres bigger than the Golf’s. Moreover, it comes with a pair of underfloor storage areas just in case you need even more space, but a tall load lip will get annoying. One of the most pleasing aspects of this car is the sheer amount of kit that comes as standard. The basic trim feels anything but basic with its LED daytime running lights, air conditioning, cruise control and DAB digital radio. The Sportium trim adds 16” alloys, automatic headlights, dual-zone climate control, and lumbar support, while opting for the Allure model will get you 17” alloys, a rear camera, and full LED headlights. The sporty GT trim throws in lowered suspension, a Driver Emergency pack, aluminium pedals and 18” alloys. Prices for the new car start out from £16,000 and rise to just shy of £27,000. If you prefer to lease you can find more information on our leasing deals at our page here. The 308 weighs less than last time around and although this has made it a little bit less robust and therefore less safe, it is more fun to drive – and it’s also cheaper to run. The 1.6-litre 120 BlueHDi diesel engine is especially impressive and can achieve average fuel economy returns of around 88.3mpg. This more than makes it a match for the cheapest engine to run in the Volkswagen Golf’s range. When it comes to insurance, the car is reasonably inexpensive to insure. The entry-level model sits in group 9, while the range-topping 2.0-litre diesel engine sits in group 29. The car comes with a bog-standard three-year warranty, and you can snap up an all-inclusive maintenance plan for just £12.99 a month. Thanks to fluid handling and good ride quality, the new car is very relaxing to drive. Comfort is pretty much assured, no matter which model you go for. The interior is modern, high-quality and stylish. Whereas rivals such as the VW Golf have favoured a more traditional layout, the 308 has gone for something more contemporary. Impressive. You won’t be stuck for choice and there is something for all seasons here. In total, there are ten engines to choose from, including four diesel units and six petrols. It was high time that the 308 Hatchback got a new touchscreen system, but it’s a shame that it’s a bit of a head scratcher to operate. The huge boot means rear seated passengers have been marginalised. Your kids, however, will fit in just fine. Let’s see how the car measures up against its rivals in the comparison section of our Peugeot 308 Hatchback review. The new Ford Focus Hatchback is fun to drive, comes loaded with lots of exciting new technology – but is not the most practical car around. If on-the-road entertainment is right at the top of your list of priorities, then you don’t really need to look further than the new Ford Focus Hatchback. Now into its third generation, the 2016 Focus can’t claim to be as razor sharp as some of its predecessors, but it continues to handle better than the 308, as well as every other car in this class. The controls are responsive, the gearboxes are positive and the steering is crisp and accurate. Performance is decent right across the engine range, with the only exception being a too-mild mannered 1.6-litre petrol engine that can only deliver a mere 83bhp. Highlights in the range include a 1.0-litre 123bhp EcoBoost turbo unit that is nippy and powerful, which can get you from rest to 62mph in just 11.0 seconds. 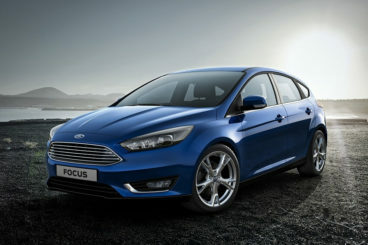 The 1.5-litre EcoBoost unit comes in two guises, with the 180bhp variant able to 0-62mph in 8.6 seconds. Comfort is assured, even if you opt for one of the less powerful diesel engines, but opting for the bigger 17 or 18” alloys will make the car less comfortable. Similarly, choosing a five-speed instead of a six-speed model will compromise refinement. In terms of its running costs, the cheapest engine to run is a 1.5-litre TDCi diesel engine. It’s free to tax and averages fuel economy returns of 74.3mg. A 2.0-litre 148bhp diesel is also impressive and is good for 70.6mpg while costing just £20 a year in road tax. The aforementioned 1.0-litre EcoBoost unit flies the flag for the petrol engines and averages returns of 61.4mpg while emitting 105g/km of CO2 in 98bhp guise. 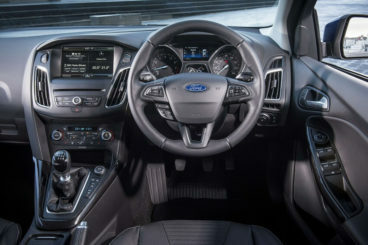 The interior is well-built and the dashboard is free from clutter, while the soft suspension ensures plenty of comfort. Most of the plastics in the cabin are of a high quality, but you will also notice some cheaper ones, too. Silver trim is worth adding if you don’t want to sit in a bland grey environment all the time, although the Red Edition models add even more colour. Strangely enough, although this new Focus is bigger than last time, it’s actually smaller inside. It’s easy enough to park despite its enlarged dimensions, but visibility is a bit of an issue, with a reversing camera only available as an optional extra. The door bins are on the small size, as is the central armrest cubby, while the boot measures 316-litres. 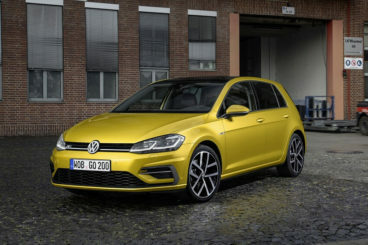 The new Volkswagen Golf Hatchback has been around for decades and is now something of an iconic name in car showrooms. But has it still got it? Whichever model you choose, the VW Golf Hatchback will be fab to drive. The car is quiet, comfortable and offers precise steering that gives you plenty of confidence. All the engines are willing performers and none will disappoint. The only one you might want to avoid looking at if you’ll be clocking up those motorway miles is a small 1.2-litre 84bhp TSI petrol. The 1.0-litre TSI BlueMotion is the better option and can do 0-62mph in 9.7 seconds, although the 1.4 or 1.6-litre petrol units are smoother and more powerful. The 1.6-litre TDI diesel is proving to be the most popular with buyers, though. It’s efficient and cheap to run and can average returns of 83.1mpg. The 1.0-litre TSI BlueMotion petrol isn’t exactly expensive to run either though and can return fuel economy of 65.7mpg. The interior is one of the Golf’s strengths. The dash is more traditional than the modern-looking one in the 308, but it is forged from high-quality plastics that are above and beyond anything else offered in this class. You get a real sense of occasion driving the Golf and fit and finish is excellent. The driving position is fantastic, soft touch plastics are everywhere and there is more interior space than last time around – three adults in the rear should be more than comfortable, even on longer journeys. The boot measures 380-litres, while huge door pockets and a massive cooled glovebox will help you to keep the car tidy. The new 308 is a five-door family hatch that ticks a lot of boxes. Whereas last time around the “style” box was left unchecked, it’s now the first one that’s crossed off. Follow that with a few thick crosses through the comfort, handling, economical and classy interior boxes and the Peugeot 308 Hatchback represents an excellent choice. 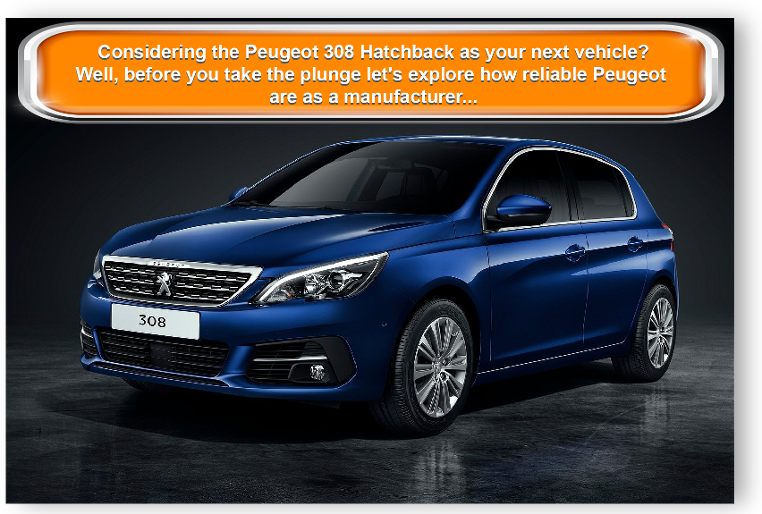 Looking For A Price For The Peugeot 308 Hatchback?